Puteoli is where Paul, as a prisoner, landed on his way to Rome. He spent a week here with “brothers” before beginning his land journey to Rome (Acts 28:13–14). 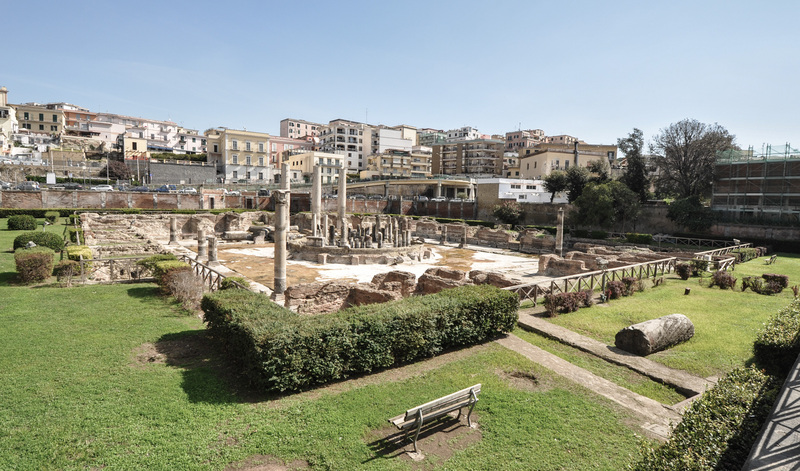 The modern name for ancient Puteoli is Pozzuoli and it is located west of Naples. It was a very important harbor in Roman Times. 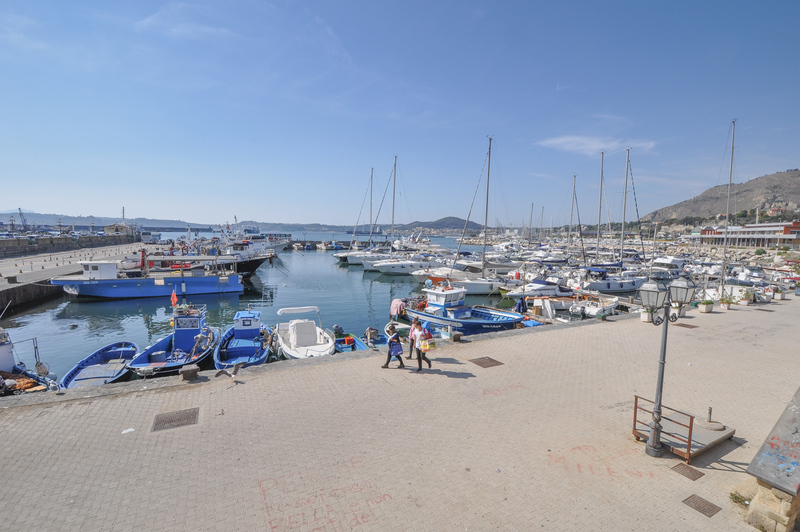 The small boat harbor at Puteoli (modern Pozzuoli). Click on Images to Enlarge and/or Download. Most of the ancient travelers to Rome would land at Puteoli and then follow the Via Appia into the city—as Paul did. The large Roman grain ships, bringing grain from Alexandria Egypt, also docked here. Because in Paul’s day (ca. A.D. 60) Ostia, the main port of Rome, could not yet handle the very large Alexandrian grain ships, these ships often would dock at Puteoli and offload their grain on to smaller vessels that in turn would carry the grain to Ostia. Later, the port of Ostia was enlarged and could accommodate the large Alexandrian grain ships. View looking north at the Market Place of ancient Puteoli (= macellum). Shops outline the square market. In the center of the market is a round structure called a tholos. At the far end is a temple for the Imperial Cult (aka Emperor worship). A statue of the Egyptian deity Serapis was found here and thus this area is sometimes called the Temple of Serapis. The market dates to the first and second centuries A.D. and was restored in the third century. 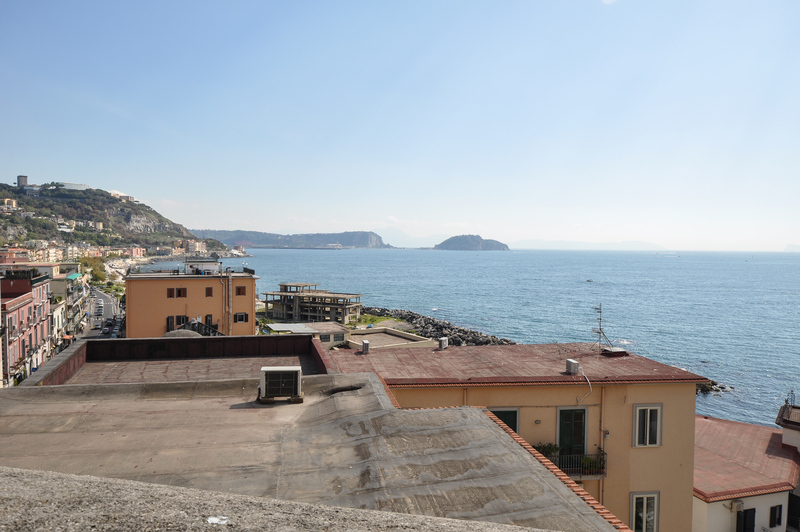 Because Pozzuoli sits on top of the caldera of a volcano, the market has risen and sunk through the ages. At times 19.5 feet of the columns were under water—due to sinking! Between 1982 and 1994 the land rose 5.6 feet! In 2017, when the above picture was taken, very little of the Macellum was under water. View of the Bay of Puteoli looking east northeast—with the Island of Nisida in the distance. Puteoli was a Roman Colony and many elite Romans had villas here—and at nearby Baia. The Roman naval base was at nearby Misenum. The city was/is located directly over the caldera of a volcano and thus there were/are many thermal baths here as well. 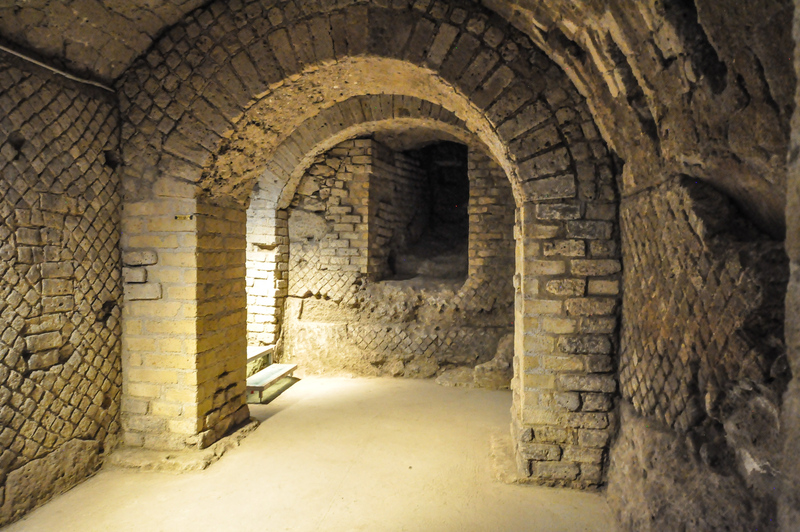 View of the underground excavations of Puteoli (modern Pozzuoli). Note the detail of the Roman brickwork. The structures date to the Roman Period. 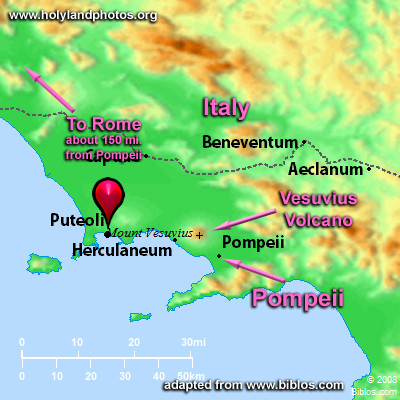 Map of Puteoli and nearby Mount Vesuvius and Pompeii. To view additional images of Puteoli Click Here. Church of Holy Sepulcher — The Syrians and the "Tomb of Joseph of Arimathea"